Maintaining the masonry of your chimney is one of the best things you can do for the overall health of your fireplace and chimney system. One important masonry component that often does not get the attention it needs is the chimney crown. The chimney crown is the masonry that seals the top of the chimney around the flue. When properly built, chimney crowns will be slightly angled in order to divert water away from the chimney and onto the roof. Unlike other parts of the chimney, chimney crowns are constantly exposed to the elements. Because of this, they often see damage due to overexposure to moisture. Over time, exposure to rain and ice and the heat and rays of the sun can cause cracks to form. Even small cracks in the masonry of the chimney crown can be a problem. Chips and cracks allow water to penetrate the masonry, causing further damage. These kinds of cracks in the chimney crown can quickly lead to water damage in the chimney and fireplace or on the walls and ceilings inside your home. If your chimney crown is damaged, it should be repaired as soon as possible. At Olde Towne Chimney & Fireplace Sales, our expert masons can repair your chimney crown or build you a new one if needed. Concrete is one of the most popular building materials for chimney crowns. Traditional masonry mortar is considerably weaker and is damaged by the elements much more quickly, making concrete an ideal choice. When mixed correctly and properly built, a concrete chimney crown can withstand the elements and last for many years. There are several new synthetic chimney crown materials that have been recently developed in the fireplace industry.  If your chimney is located in an area of the roof that is exposed to harsh winds, sunlight or other weather elements, a synthetic masonry cement may be recommended. These materials can often last longer than traditional concrete chimney crowns. Repair Your Chimney Crown Today! If your chimney crown is damaged, call Olde Towne Chimney today at 812-284-0123 to schedule an appointment to have it repaired! Click here for online scheduling! A leaky chimney can cause untold damage to your home in a short time. 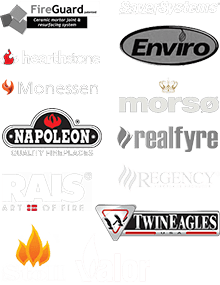 Don’t delay in finding out if you need this critical chimney repair.